The Leica Macro Elmar-M 90mm f4 is designed to maintain very high optical performance even at distances much shorter than the usual 2.3 feet (0.70cm). In connection with the Leica Macro Adapter-M, this lens allows shots with a reproduction ratio up to 1:3. The Leica Angle Viewfinder M can be used on all Leica models except the first M3 Series (Production year 1954). It shows a large round upright, and un-reversed central section of the viewfinder image of approximatly .3 inches. With it's freely rotatable 45 degree eyepiece, it makes it considerably easier to view the subject in all situations, where the photographer does not want to hold the camera exactly in front of his/her eye, for example in case of reproductions. Especially for close-ups close to the ground with the Leica Macro-Elmar M 90mm f/4, utilizing the Angle Viewfinder M allows for a much more comfortable posture. When the Angle Viewfinder M is not being used, it can be stored in it's matching high-grade leather case that is included with the Angle Viewfinder M.
The LEICA MACRO-ADAPTER-M was specifically developed as an accessory for the LEICA MACRO-ELMAR-M 90mm f/4. It allows close focusing from 0.77m (reproduction ratio 1:6,7) down to 0.5m (reproduction ratio 1:3). When the lens is to be used in its close-focusing range from 0.77 to 0.5m, the LEICA MACRO-ADAPTER-M is attached to the camera body instead of the lens. The lens is then mounted on the adapter after rotating it 180°, i.e. with its lower side turned up. In this position, a second pair of distance and depth of field scales for the respective focusing range becomes visible, enabling easy reading from above. 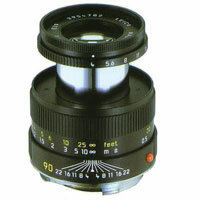 The LEICA MACRO-ELMAR-M 90mm f/4 is available both in black anodized and silver chrome finish. It comes with a dedicated separate metal lens hood. The Adapter is delivered with a practical leather case featuring a belt loop. Number of Elements / Groups: 4 Elements in 4 Groups. Angle of View (Diagonal, Horizontal, Vertical): 27°, 23°, 15°. 0.5 m to 0.76 m ( 19.69" to 29.92" ) with the Leica Macro-Adapter-M. Highest Reproduction Ratio: 1:6.7 ( with Leica Macro-Adapter-M: 1:3 ). Internal Thread for Screw-in Type Filters E 39, ( 39mm ). Length: 59 mm ( 2.323" ) Lens Extended in Working Position, 41 mm ( 1.61" ) Lens Collapsed in Storage Position. Largest diameter: 52 mm ( 2.05" ). Approximately 240 g ( 8.47 ounces ) for the Black Anodized Aluminium Version, 320 g ( 11.29 ounces ) for the Silver Chrome-Plated Brass Version. Distance Setting: Scale: Combined Meter/Feet-Increments, Separate Metal Lens Hood, Can be Attached in Reverse for Storage.